" Now at give away price and it comes with a FREE cafe racer fairing What are you waiting for Please get in touch "
" The all-new Speedmaster 1200cc brings a whole new dimension to the Bonneville line-up. With its classic British custom laid-back attitude, forward footpegs, swept-back beach bars and comfortable pillion capability, the new Speedmaster delivers a distinctive cruiser riding position with timeless sophisticated style. 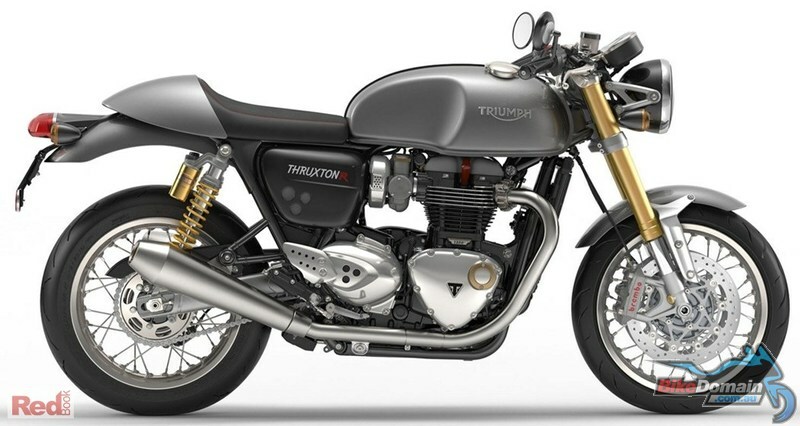 In addition, high..."
" The Thruxton and Thruxton R are the real deal; the ultimate modern classic café racers. Each equipped with the 1200cc ‘Thruxton spec’ engine, these thrilling motorbikes have the handling, agility and capability to complement the beautifully imposing authentic Thruxton styling, ensuring both models have all the poise, power and performance to..."
" The 2017 sale event, most of the Triumph range is on sale, come in for a test ride or just drop in. The Classic Bonneville T100 motorcycle with the distinctive 900cc engine sound is a great classic cruiser. Come in and have a test ride between 1/10/18 & 15/12/18 and you may even win a brand new one for free (*Conditions apply)..."
" As New 2017 Triumph Bonneville T120 (1200cc) Black motorcycle, one previous owner, only 8035kms on the clock, excellent condition, service history, ready to ride with registration until August, 2019. A fantastic Bonneville classic that will definitely turn heads as you ride by on this blacked out bike. Heated grips, high torque engine, two..."
" Bonneville Street Cup..a great cafe racer motorcycle with the Bonneville 900cc engine with a distinctive sound that will have heads turning as you ride by. Great for commuting or getting away on weekend country rides. come in and see us for more details or come in for a test ride "
" The New 2018 Tiger 800 XRX adventure motorcycle is now in store with a whole bunch of new upgrades by Triumph. New Brembo brakes, 5 inch TFT electronic dash, New switchcubes & 5 way joystick, Switchable ABS & traction control, LED headlight with DRL, 5-way adjustable screen, updated cruise control, heated grips and a host of engine..."
" The New Street Triple 765cc motorcycle is now in store. A fantastic perfoming bike with plenty of upgrades such as the new TFT electronic dash, Rider modes, switchable ABS & traction control, Quickshifter up (RS model only) & optional extra on the R model. Brembo brakes, Ohlins suspension on the RS model only. A great bike to commute on..."
" Only red left SAVE $1000.00 great value on this bike, come on in and talk a deal "